The leader of the opposition Democratic Green Party of Rwanda has called on President Paul Kagame’s government to help end the escalating violence ahead of the general elections scheduled for August this year. Frank Habineza said the period leading up to the election is contributing to the ongoing violence. Habineza’s comments follows last week’s shooting death of Leonard Rugambage, acting editor of the banned Umuvugizi independent newspaper in the capital, Kigali. “I would like to call upon the Rwandan President and the Rwandan government to do all they can, in their means, to make sure that they control the situation. I would like to call upon him (Mr. Kagame) to increase his capacity and to make sure that all Rwandans as, he had promised, can sleep and wake up without any worry that someone will kill them,” he said. Rugambage’s death has reportedly heightened tension among many Rwandans who are said to be fearful of a violent crackdown ahead of the August vote. Jean Bosco Gasasira, editor and publisher of the newspaper, is among those blaming the government for the shooting death of Rugambage, a charge the government denies. Rwanda’s Media High Council (MHC) and the Association of Rwandan Journalists (ARJ) issued statements condemning the shooting death of Rugambage and demanded a thorough investigation. Local media quoted Eric Kayiranga, spokesman for Rwanda’s police, as saying there is an investigation to ascertain the motive behind the killing of the acting newspaper editor. Opposition leader Habineza said that Rwandans do not feel safe with the ongoing violence ahead of the vote. “We want to make sure that the elections, which are coming up, are peaceful. I understand that (an) election is not the end of life; it is just the beginning of a journey to democracy. So, we don’t want to have any problem just because of (an) election,” Habineza said. Opposition groups have often accused President Kagame’s government of strongly resisting any dissent by refusing to register opposition parties ahead of the upcoming election, a charge the government denies. 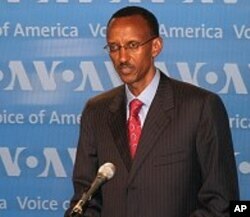 Meanwhile, analysts say the escalating violence will undermine Rwanda’s young democracy.